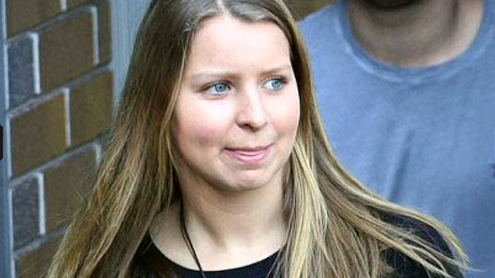 Madeleine Pulver emerged looking calm and composed after spending her first night back in the multi-million dollar Mosman home on Sydney’s north shore since the attack took place. Her father, Bill Pulver, said that all six members of the family had spent a “tender” night sleeping in the same room. He said his focus was on helping his daughter’s life return to normal as quickly as possible and that they would be seeking professional help her come to terms with the events of the past few days. Constable Karen Lowden, who risked her own life to sit with Miss Pulver for three hours despite not being fitted with any bomb protection gear, yesterday paid tribute to the 18-year-old’s courage. Constable Lowden, who has been hailed as a hero herself, said Miss Pulver had been highly distressed but had coped wonderfully while bomb experts and police worked to free her from what was then believed to be a live bomb. Miss Pulver had been at home alone studying for her final high school exams when the intruder broke in and chained the collar bomb to her neck. She was freed just before midnight after a painstaking police operation. “She did everything right, she is the strongest girl in the world at the moment,” Constable Lowden said. While Miss Pulver had been hysterical at times, “she had moments of great poise,” she said. Police said that the investigation into the elaborate extortion attempt was “on track” and “well advanced” but warned that because Australia had never seen a crime of this nature before, the investigation could be lengthy. However, one breakthrough came when one of Miss Pulver’s neighbours said they might have spotted the man responsible for the attack. Gai Waterhouse, a well known Sydney horse trainer who lives on the same street as the Pulver family, said she had seen a woman “driving up and down the street looking nervous” during the early afternoon. The two-page handwritten letter which contained no demands for money but instructions for Miss Pulver to contact the perpetrator via the internet, was signed Dirk Struan, in a reference to the lead character in James Clavell’s 1966 novel about a wealthy and violent businessman who is bent on destroying his rivals. In one chapter, an extortion threat is made against Straun and a price is put on the heads of his wife and daughter. Police have yet to comment on the use of the character’s name, but have said that investigations were focusing on the content of the letter.